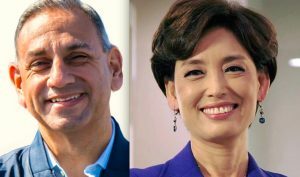 Although initial results from the Nov. 6 election in the 39th Congressional District showed Republican Young Kim ahead of Democrat Gil Cisneros, that lead eroded as ballots were tallied. As of Monday, Cisneros had 122,302 votes (51.4 percent) to Kim’s 115,869 (48.6 percent). Cisneros will succeed Rep. Ed Royce (R-Fullerton), who is retiring after 13 terms, and will join the new Democratic majority in the House of Representatives. Kim, a former member of the Assembly and former aide to Royce, would have been the first Korean American woman in Congress. Although the final days of the campaign were marred by accusations from both sides of interference in the election, Cisneros and Kim struck a conciliatory tone. “And the first Mega Million lottery winner to enter into Congress. In a statement on Nov. 17, Kim said, “This evening, I called Gil Cisneros to congratulate him and offer him my best wishes in Congress. I’m grateful that voters allowed me to share my vision and I believe that the competitive nature of this election shows that my message and service to this community resonated. I owe my deepest thanks to my family that supported me, the supporters that worked tirelessly to propel our campaign, and all the voters that believed in our vision for the future. In the 34th Senate District, Democrat Tom Umberg continued to increase his lead over the incumbent, Sen. Janet Nguyen (R-Garden Grove), who first assumed office in December 2014 after serving on the Orange County Board of Supervisors. As of Monday, Umberg had 133,302 votes (50.5 percent) to Nguyen’s 130,770 (49.5 percent). On Election Night, Umberg, a former member of the Assembly, trailed Nguyen by nearly 11,000 votes.